Many of us have heard the phrase, “Failing to forgive is like taking rat poison and expecting the other person to die.” While we may recognize how damaging unforgiveness is to our own hearts, we do not often make the effort to actually forgive. Why? We may not be ready. There may be safety issues going on that need to be addressed first. We may not truly know how to forgive. 1) Recognize the need to forgive (or be forgiven). Notice ongoing feelings of resentment or anger. Recognize an action as offensive. This involves physical safety, psychological safety, and relational safety. Seek help if you recognize that you do not feel safe. This may include a third party, a cooling-off period, or even physical separation. 3) Fire the attorney in your head. Choose to stop “pleading your case” to yourself so that you can let go of defensiveness and blaming. 4) Talk about what happened. Talk about your thoughts, feelings, concerns, and desires (what was it like for you?). Try to see the situation from the others’ perspective. Be deliberate about making the choice to speak those words. Take responsibility for choices you made, then and now. Find or create a support network (friends, family, or faith community). Release negative feelings and move on. 6) Choose to act in loving ways. Stop reminding the offender of the hurt. If the other person is not safe to be around, act in loving ways towards yourself or others not involved. Seek the good of the other. Contemporary research shows that forgiveness occurs when people commit to owning and expressing feelings, choose to forgive, and commit to actions of love. 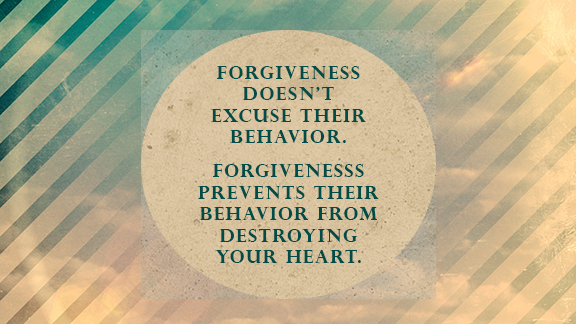 Forgiveness and healing can take TIME, and it can be a process of forgiving and then choosing to continue to forgive. It does not necessarily mean forgetting. It does not mean agreement. It is a choice to let go of the poison. If you know of situation in which you need help forgiving someone or finding forgiveness, contact our counselors who would love to help you. *Ready for Love is written by Bernard Gurney, Jr., PhD and Mary Ortwein, MS, LMFT. Ready for Love is part of the Relationship Enhancement (r) Series used by IDEALS therapists.